Hey Sart, is this all about the specs? Must be. What else is there? Flannel shirt, t-shirt, jeans with racing stripe, and those horrid white shoes I see everyone wearing. I don’t see anything else in this young chap’s dress that would warrant a photo op. LBT (above) typically has a stick up his bum. In this case, I’ll agree with him though – the big white sneakers thing is goofy. Nobody old enough to remember the 1980s will fall for this look. yeah what’s with the jeans? I see guys dressed alike in my home town.His ´look´is global. I thought that was a flannel shirt at first glance myself, but a closer look shows that it’s a plaid sports coat. That brings the style level up considerably. First I thought «nothing special», but then I realised it’s not a Flannel he’s wearing but a jacket – and thats way cool! Flannel jacket – love it! I’d say it’s about those dark blue lines and how the t-shirt matches the rest of the outfit. Beautiful really. I think I feel a rush of tuxedo jeans coming on….And, yes, I did wear that jacket to my First Communion in 1972–not that anyone asked. 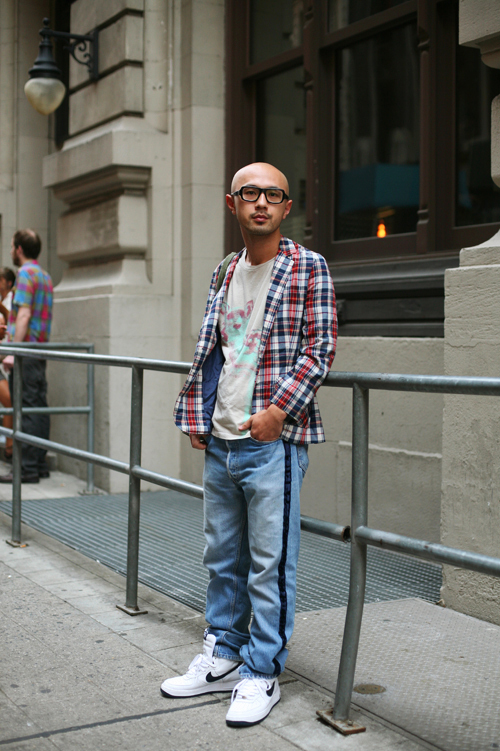 Glasses, plaid jacket, Salvor tee, tuxedo striped jeans…he had me until I got to the big white Nikes. Ugh! It’s about how the racing stripe on the pants runs right into the swoosh on his sneaker the works for me. love the overall look but find the tuxedo stripe on the jean distracting. Horrid white shoes…you mean Nikes? And I choose to believe his jeans have a tuxedo stripe. Plaid jacket also well done. Naw, this is about the stripe down his trouser leg(s?)…. Love his plaid blazer. Very cool. original. i loved the flannel/sports coat confusion. makes it an intersting piece, although in person, i’m sure it’s much more apparently a jacket. the big-sneaks-with-baggy-jeans tend to make anyone seem particualry wee, but he has so much personality that it doesn’t seem to matter for him. a few people have said the kicks are the problem, but i’m curious, what other type of shoe would anyone suggest? i don’t personally love them, but they really seem to parallel the urban/sporty/preppy/funky style he’s established, to a tee. any thoughts? Deirdre is right that it about the black line that goes down the pant leg to end in the swish on the shoe. Note that the line starts in the plaid on the sports coat. his glasses are too small for him.. i don’t understand the appeal in this composition at all. It’s the whole comp. The diagonals barrel toward you. The street lamp above mimics head shape. The repetition of line and shape. The shoe swoosh is repeated at the waist, the hook of the hand, swooping arm, line at neck and the hook of the glasses at the ear. The little light reflecting in the window and then that bent pole by the leg. Who is this dude? He’s my exact twin it’s creepy!! !